Earlier this month, Heidi Groshelle invited me as a keynote speaker to the ExecEvent organized by Greg Duplessie — it is an exclusive networking event for industry executives focusing on the data storage marketplace. I was asked to share tips and tricks about being an executive. Vast topic! So I decided to address only one theme: Reinvent yourself continuously to create your own A-Team. When I came from France to Silicon Valley in the late 1980s to found a tech startup, I learned one key thing: that what I knew was nothing compared to what I didn’t know… Since then this has been my motto. As counter-intuitive as this may be, I would say that keeping one’s self confidence in check helps to continuously rekindle creativity and develop new tools of self-reliance. 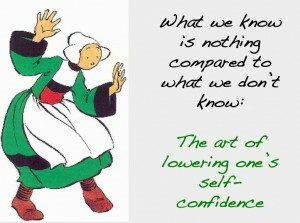 I am glad that more researchers start to emphasize the power of “less-confidence.” I mentioned a great piece by Tomas Chamarro-Premusic, Professor of Business Psychology in London (UCL), for HBR: Less-Confident People can be More Successful. My take-away: Confidence that you have built over the years relates to what you did, not what you will do. 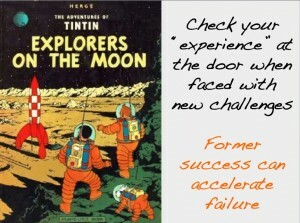 Yes, it’s hard to check your experience at the door… But consider this: The experience that we have acquired in a job may be valuable, but more often than not, this same experience may encourage us to operate on automatic pilot, and therefore can prevent us from seeing what’s new or what should be different. Tintin’s moon mostly resembles the Alps without the trees, and his vehicle is more like a tank — nothing in common with Lunar Roving Vehicles (LRV) of the Apollo missions. Checking your experience at the door means, in practice, letting the scales fall from your eyes. After one year in any job, these scales are forming fast… My take-away: While it’s a cliché to say that a failure can accelerate success, it’s also true that former success can cause failure. Sure, you may feel lonely when you start something new, and the temptation is to hold on to what you know, or find reassurance from people “who know more.” While it’s good to listen to the experience of others, it’s equally critical to make sure that they are not affected by their own Tintin syndrome. When I started my first company, I was advised to hire “seasoned executives” with 10 years of experience… Even though desktop software was new, even though Macintosh was really new, it was already the craze to hire “industry veterans.” I was not used to business verbiage and was scratching my head. There were no veterans in the Apple world… and the self-proclaimed veterans hated the Mac and were shouting that Apple was doomed to fail. My take-away: Seasoned executives may be great, but they may also have vested interest in the past. So watch for the birds that can help you move towards new skies. You can’t lead alone, except when you are a dictator (and want to die a violent death). So, how do you surround yourself? “Hire ‘infected’ people,” to use great expression by my friend Guy Kawasaki in The Art of the Start: “It’s often easier to teach an infected candidate how to do a job than to teach an agnostic (or atheist) how to believe.” This is true for startups, of course, but also for large corporations who want to innovate again. I can safely say that my various companies had the most diverse people. None was born “seasoned,” and all turned out to be extremely effective. These people were not connected to one another because of their background or their education. They were connected to one another because of a common purpose. My takeaway: Unity doesn’t mean uniformity. Diversity creates vibrant and energetic companies. After hiring a few hundred people myself over the last 25 years, I realized that I never looked for the perfect resume. More exactly, I was discouraged by resumes very early on, because they were full of what I later discovered were called “key words.” When I was asking the candidates what they meant, I was regularly disappointed. So basically I always ended up “hiring for attitude” to use the title of Mark Murphy’s book. 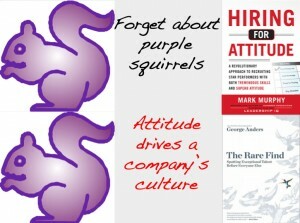 I never looked for the “purple squirrel” considering that when people have a passion, they learn fast. Training new employees is far more cost-effective that experiencing high turnover, anyway. Now that I am in the HR industry as the CEO of TalentCircles, I am finding out that turnover is even worse than I thought: “46% of people hired in 2012 will fail within the first 18 months on the job,” and “an astounding 89% of the time, employees fail for attitudinal reasons, and only 11% of the time because of skill.” Also, of course, I recommended George Anders’ remarkable essay, “The Rare Find.” My take-away: In practice, spotting talent before everybody else is the ability to help people develop their potential. Hiring for attitude means finding your “brown shorts,” the people who will really be able to contribute to your team: a Southwest interviewer had asked pilot interviewees to wear the company’s Summer uniform (brown Bermuda shorts instead of formal pants). The candidates refusing to wear the shorts showed that they were not a good fit. I never had any specific name to my various teams. Call yours the “penguins of Madagascar” if you want. 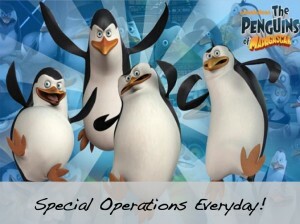 Skipper, Kowalski, Rico and Private are cute-looking penguins, but with unique commando skills. They will make competitors “crazy” and make customers fall in love. And each is a true evangelist of the company’s culture, both inside and outside, and so committed to the cause that you can let them talk on social networks. My take-way: Let your team speak on social media channels. As they communicate, they also learn what’s going on in the industry. If they don’t, you may be running a nursing home. 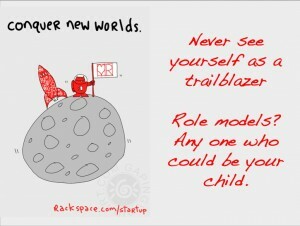 I love this cartoon created by Hugh MacLeod for Rackspace and its “Rackers,” where the Little Prince is a cosmonaut and Tintin’s space shuttle, a hybrid of nature and culture. My take-way: Even large companies can think like startups. The Diverse Leaders Program : Late this spring I was nominated and accepted to attend the Diverse Leaders Program with my new company Wells Fargo. I joined Wells Fargo after a 15-year career at a similarly large multi-national company holding various leadership roles within its Talent Acquisition organization. What makes this story of a Diversity program unique is that in addition to being singled out for my potential as a leader, the reason for my selection was not so clear to me. I was not selected as a woman who has been climbing the proverbial ladder in a heavily female recruiting profession led predominantly by men, nor because my mother, who was born in Mexico, immigrated here as a child in search for the American Dream for her family. I was selected for neither of these reasons although they would both be true. I was selected instead as a self-identified lesbian and a high potential leader to be given additional training to improve my skills as a manager and leader for the betterment of myself, my team members, my customers and our local communities. I admit, upon learning about my selection, I could not imagine what my “gayness” could possibly have to do with my leadership skills but I intended to find out. The competitive advantage of real inclusiveness: I arrived to the company boardroom the first morning; I was greeted by the fine facilitators at Jennifer Brown Consulting. It was clear in meeting my new cohorts we were all stepping in the room as skeptics and slightly confused as we all talked about it coffee in hand. As things got underway, I found myself in a room full of accomplished bankers, activists, community leaders and things started as most corporate training sessions do… the dreaded introductions. I found myself with my normal reaction to this process… trying to suppress my eyes from rolling but shortly after it started I became riveted by the stories of the people in the room and how this for the first time seemed different. Although most of these people looked, talked and in fact were different from me, for the first time in my professional career, there was a common theme. We then proceeded through the week using assessments and concepts to better understand our styles of leadership. We also openly talked about how we all felt driven to succeed so no one could say that if we failed it was because of our “gayness”… I remember thinking I did not realize others felt that way too. We went on to discover our leadership skills throughout the week and I was surprised as to how much I was getting from this experience. After three jammed packed days we ‘graduated’ and Jennifer Brown gave us our last word… our last turn at the floor to tell the class whatever we wanted. In preparing my last word was when I finally found the answer to my question, “what does my gayness have to do with my leadership style?” So I delivered my answer to my 42 new friends…. The answer was nothing… My “gayness” was not the point when dealing with who I am as a leader, manager or team member at Wells Fargo. Instead what I found was that this program was something entirely different. Instead it was about inclusion, real inclusion. Inclusion is a word, I admit I thought was the latest installment of corporate jargon to keep people on their toes and I really never understood it. I have always understood why having a mix of different people in a workforce would be good to mirror the communities we worked in but to be truly included (every part of me) by a company, for the first time, was something I did not expect nor could I anticipate the impact. Diversity and inclusiveness is something Wells considers a competitive advantage, and with their investment in my cohorts and myself I would say they are right. They went beyond tolerating us and teaching us what they want us to know and instead asked us to be the best leaders we could be and bring all of us to work knowing that would make us better as a company if all 265,000 team members did that. I’d say I agree! How many times have HR Professionals heard Gerry Crispin discuss the importance of providing an outstanding candidate experience? How many companies truly act on his recommendations? Not enough. To evaluate how your company fares, check one of Gerry Crispin‘s presentations or make sure to catch one of his talks. If you believe that your company is ahead of the curve, apply for the Candidate Experience Award. Many companies still have the mindset that people should just be happy to get a job, especially at times of significant unemployment. Sure, unemployed persons will see the opportunity to land a job as a godsend. Will a positive result make them necessarily forget about their painful experience to get it? Unlikely. They may just leave for another company at the first opportunity, simply because they never had the personal feeling of being truly valued and desired in the first place: companies spend fortunes hiring, but the costs of talent churn are outrageous! Over 50% of job applicants are unlikely to buy from or recommend a company that mistreated them. Even more importantly, candidates have all the capabilities to tell their stories, and not all of them are just disgruntled creeps. 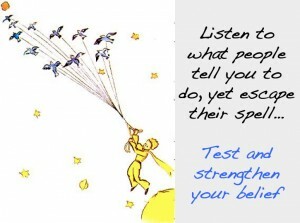 They are human beings, and may become the talent that will make your competitors shine. Embrace the universe! Keep your candidates informed at all times in the process and go even further, welcome the universe onto your own planet! Welcome candidates into your “TalentCircles.” The candidates for whom you don’t have a position today may be people you need tomorrow. Why “re-source” them when a little bit of forward-looking thinking might drive your time-to-hire to almost nothing down the road. Candidates that you will never hire are valuable: they can still admire your company and refer people that are more useful to you! Even at a time when everybody is high on “big data,” the world is actually small if you look at it from a network standpoint. In fact, treating people well is not just good business, it’s often excellent business! Also posted on the blog of TalentCircles. On June 1946, at Buckingham Palace, a little kid born in Vizhupanoor in 1898 and who spent his early childhood in Watrap (both places now part of the Virudhunagar district in Southern India) became Sir Kariamanikkam Srinivasa Krishnan for his scientific contributions. Just one honor among multiple other national and international recognitions: the first was the Liège University Medal in 1937 and the second was his election to the fellowship of the Royal Society in 1941 (thus joining an exclusive group of only three other living Indian scientists, C.V. Raman, M.N. Saha and Birbal Sahni). His election to the Royal Society of Arts in 1951 was yet another huge honor — no greater, though, for the son of an orthodox Brahmin, who mastered Sanskrit, Tamil and the art of story-telling as well as his father, than being awarded the Padma Bhushan by the Government of India in 1954 and becoming the first recipient of the Bhatnagar Award in 1958. 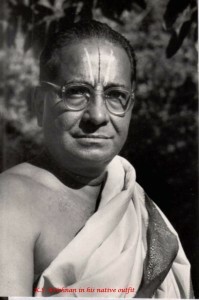 The book, Kariamanikam Srinivasa Krishnan, his life and career by D.C.V. Mallik and Sabyasachi Chatterjee, both physicists, is a fantastic and thorough tribute to one of the fathers of modern India (and whose grandson, T.M. Ravi, is a successful Silicon Valley entrepreneur). Missing the Nobel Prize with no grievance… Historians will wonder for ever if Krishnan should have been given credit for his part in the discovery of the Raman effect that gave India its first Nobel Prize in Science in 1930 (Rabindranath Tagore had received the Nobel Prize in literature in 1913). If it’s obvious that C.V. Raman, Krishnan’s mentor and research guide at the Indian Association for the Cultivation of Science in Calcutta (now Kolkata) largely benefited from the experiments on the scattering of the light in liquids of his student, KS Krishnan turned out to be a distinguished scientist in his own right. When he left for Dacca (Dhaka – now in Bangladesh), he also left the field of Raman scattering. Over the course of his various tenures (in Dacca, again Calcutta, Allahabad and in Delhi), Krishnan focused on magnetism (especially crystal magnetism), pioneered work on electrical resistivity in metals, ventured in pure math (on what is now known as band-limited functions), and took up lattice oscillations in ionic crystals and thermionic properties of metals and semiconductors. This amazing corpus of work (that also required the ability to create the labs enabling such extensive research) won K.S. Krishnan the admiration of his fellow scientists both in India and internationally, the absolute devotion of his students, and the admiration of his countrymen, Jawaharlal Nehru being one of them. This book being written by two scientists, Krishnan’s scientific work is analyzed extremely carefully. A few pages here and there may not be easy to understand for laypeople. No big deal. Skip these pages — yet realize how much the first generation of Indian scientists went through challenges of sometimes epic proportions and yet, through their amazing leadership, were able to play at an international level with extremely limited means. Participating in the birth of a modern country with a deep sense of traditional values: When K.S. Krishnan told his mother and in bride 1916 that he would never live in rural Watrap, and instead would become a scientist, and study at the Christian College of Madras (now Chennai), he was following the spell of the first successful generation of Indian scientists. When he moved to Calcutta in July 1920 to study under Raman, he was also stepping into the intellectual and political awakening of India. Understandably, he was drawn into the political intensity of the time: he attended every part of the special session of the Indian National Congress held in Calcutta in September 1920 (when Gandhi won by a narrow margin and was followed by Motilal Nehru accompanied by his son, Jawaharlal). His fervent involvement led to his selection as one of the student representatives to the All India Students’ Convention, which was to be held in Nagpur. However, Bidhu Bhushan Ray, K.S. Krishnan’s friend and teacher, persuaded him to stay focused on science — which was by itself a nationalist mission too as the young generation intended to show the British rulers that they would be their equal in science too. His various trips to Europe starting in the late thirties also sharpened his awareness of the role of science in the industrial development of the country. By accepting the role of Physics Chair in Allahabad in 1942, he ended up moving close to the national center of activity and became part of the core group of scientists selected by Jawaharlal Nehru to shape India as a modern industrialized nation. After opening the thirty seventh annual session of the Indian Science Congress in Dehli, Nehru, now Vice-President of the interim National Gouvernment, made it clear to K.S. Krishnan that he wanted him to not only work for science, but also for the country. K.S. 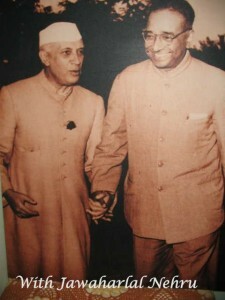 Krishnan moved to Dehli and took over the directorship of the National Physical Laboratory (NPL) set up by free India. From then on K.S. Krishnan played a critical role was associated with the most important scientific and educational organizations in the country (including the Atomic Energy Commission), and became an influential figure in multiple international science organizations. K.S. Krishnan died of a heart attack in July 1961. He remained a researcher until the end (his last paper had just come out). He traveled the world and his country for science, yet his heart never left the Sathuragiri Hills, the abode of deities: K.S. Krishnan was also a legendary scholar in the Vaishnava philosophy, theology, and culture! 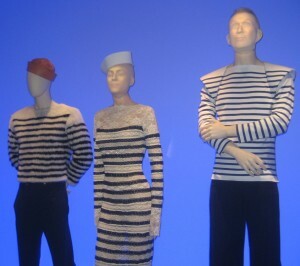 San Francisco welcomed Jean-Paul Gaultier with open arms for the arrival of The Fashion World of Jean Paul Gaultier: From the Sidewalk to the Catwalk, an exhibit originally created at the Musée des beaux-arts de Montréal (MBAM) in 2011 by Nathalie Bondil. The collection, which has already been shown in Dallas, will be at the deYoung Museum in San Francisco until August 19, then in Madrid from September to November 2012, and in Rotterdam from February to May 2013. Go catch it if you can! 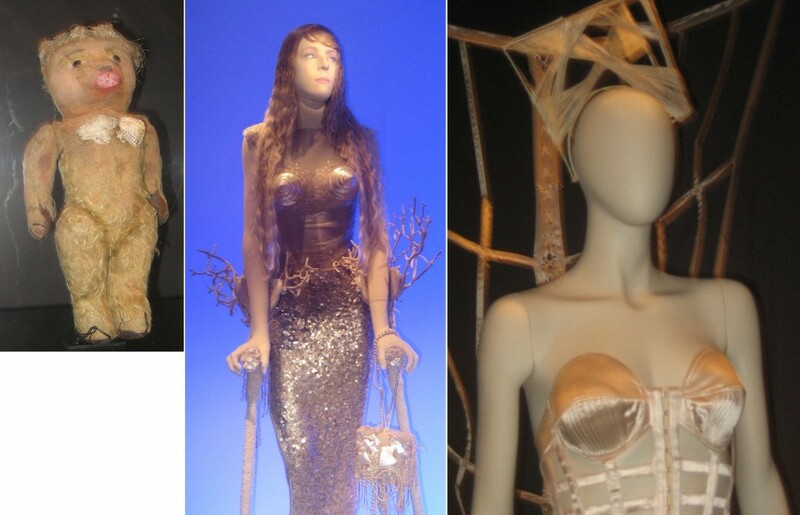 The exhibit isn’t merely a retrospective, but rather an art installation of Gaultier’s world. His works, put together by UBU, the Quebecois theater company run by Denis Marleau, combines multimedia animation organized by theme and realistic mannequins with the ability to speak. 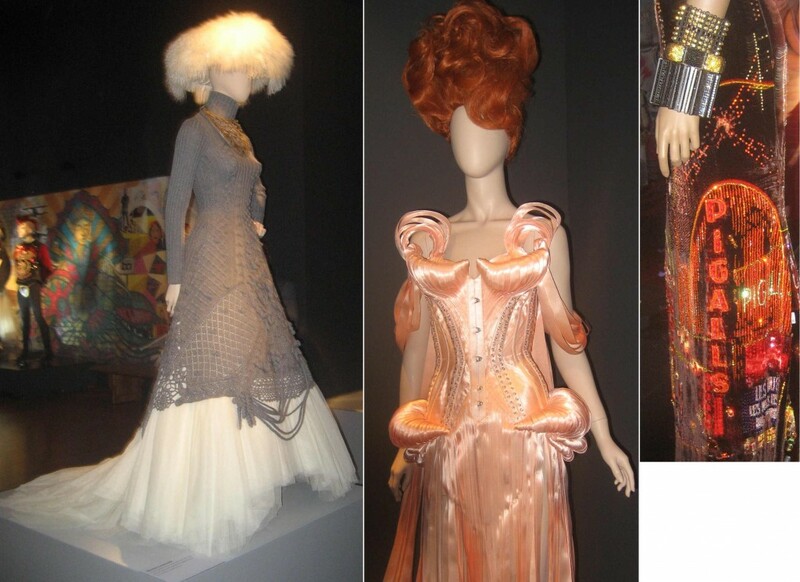 The exhibit has a certain timeless quality, and what emerges is the coherence in Jean-Paul Gaultier’s design aesthetic. Certain influences – from world events to street trends – give an individual character to each collection, which fashion journalists invariably pick out season after season. However, within the context of this collection, which is thematic rather than chronological, Gaultier’s extraordinarily unified tone, spirit, and inspiration become eminently clear. 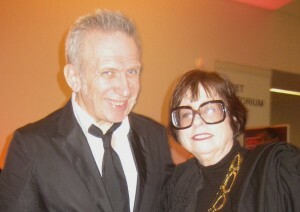 This is ultimately what makes a great artist, or a great couturier, able to mix ideas and genres without losing focus. “What we see of an object placed before us, what we hear of sentence spoken in our ear, is very little indeed, next to what our memory adds to it,” said Henri Bergson. The accordionist Yvette Horner has little in common with Madonna, and yet both of them coexist, reincarnated in this exhibit, along with Naomi Campbell and many others standing in front of the Michou cabaret, rue des Martyrs in Paris, in the imaginary world of Gaultier. A creative imagination always starts somewhere. For Jean-Paul Gaultier, it’s in his childhood with his grandmother, who had gone back to work after her husband’s smock enterprise had failed. She began a skin care business that offered as much sentimental advice as it did creams and face masks. The young Jean-Paul was always hanging around; at the beginning of the eighties he once told me that “it was fabulous and, truth be told, an odd sort of education.” His grandmother succumbed to all his moods, allowed him to play with his Régécolor [a brand of coloring shampoo that had been created by l’Oréal], let him watch anything he wanted on television, including fare normally forbidden to children like the piece on the Folies-Bergère that fascinated and enthralled him at the age of nine. The only thing that Jean-Paul could not have was a doll of his own: “My grandmother would show me her dolls from the turn of the century, which, naturally, I found extraordinary. Because I wasn’t allowed to have a doll – my mother would have thrown a fit – I got a Teddy bear that I ended up turning into a doll,” and to which he added his now iconic conical breasts. One of the first objects of the exhibit is this bear. The breasts became conjoined to his grandmother’s salmon-colored corset, and together they rise to the corset dress Jean-Paul created 1983, adapted over multiple iterations through the years. Like his perfume line’s tin cans, and many other objects in the Gaultier imagination, the striped sailor shirt is “ready made” our “found art” in the style of Marcel Duchamp: that is, “an everyday object promoted to art object simply by the decision of the artist,” as André Breton defined in his Dictionnaire abrégé du surréalisme. Jean-Paul is himself a sailor in his craft, an adventurer to far-flung places whose relative distance is always measured from the meridian line of his memory, in Arcueil and Paris. By his hand, the hard waves of the open sea are tempered when they become the veins in the marble of chapels and saintly statuaries, and the gaze of Madonna melds into that of the seductive Micheline from Jacques Becker’s film Falbalas. The designer always returns to his beginnings: Spanish ladies as represented by Bizet; Russian elegance as exemplified by Elisabeth de Riquet of Caraman, Countess Greffulhe; and laces and bustles from Yvonne, who had worked in Paquin’s atelier before becoming the housekeeper for Jean-Paul’s grandmother. For Jean-Paul, fashion is not second nature. It is the amalgam of everything he has ever loved, a land of marvels focused in Paris, where he has chosen to settle indefinitely and from which to the rest of the world can reverberate. The exhibit’s catalogue, created by Thierry-Maxime Loriot, explores this giant of fashion and showmanship. It’s a beautiful book, published in French by the Editions de la Martinière and in English by Abrams Books. Invent Your Future is the name of a Conference that Ruth Stergiou co-founded with Denise Brosseau in 2005 and of which Ruth is the CEO. The event will take place on March 22, 2012, at the Santa Clara Convention Center. I like the phrase: “Invent Your Future,” as even though women have come a long way over the last 50 years, we still have a lot to accomplish! Recent political events show that women might easily be dragged into the past, and we will once again face an uphill battle if we do not take control over our future. We must realize that “The Game is Changing,” as the theme of the Conference says — in other words, if we do not make it clear that the times of taking women for granted are over. Changing the game means strengthening women as both individuals AND as a group forever. No matter how extraordinary the success of some individuals, it’s not enough to admire trailblazers, as this may also implicitly condone the idea that the bar must be higher for women, which might be in turn somewhat intimidating. The importance of a conference such as Invent Your Future is that it welcomes an amazingly large spectrum of women, as I could see for myself last year, ranging from women who “made it” to women who don’t feel “quite ready” one way or the other or are somewhat nervous at the idea of getting out of the “comfort zone” they have been assigned. This conference is designed to move women from corrective and defensive activism to a transformative attitude, offering great keynote speakers (Reid Hoffman, Martha Beck, Gina Amaro Rudan and Nandini Ramani), as well as theme-based and “Share the Wisdom” roundtable sessions. Any company in Silicon Valley (or elsewhere) that is serious about empowering women should encourage its female workforce to attend. 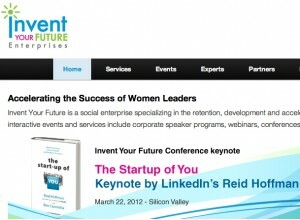 Invent Your Future is all about the power of empowering women. 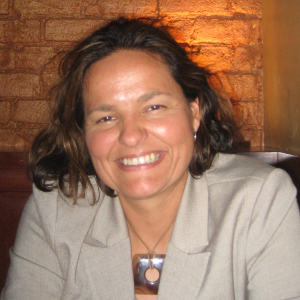 Ruth Stergiou’s bio says that she has dedicated 20+ years of her life to “foster the retention, development and acceleration of women leaders,” and this is undeniably the case. This conference is one of the ways she is creating momentum for women, as collective power is key to scaling individual successes. Attend! 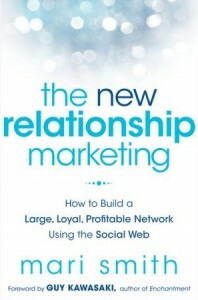 Mari Smith, probably the ultimate Facebook guru (see my review in March 2011), is also the author of The New Relationship Marketing that came out last October. Social networks tend to be perceived as channels, or as conduits that enable us to broadcast information in order to attract attention, and more often than not we may forget the key premise of social networking that Mari Smith’s book reminds us of: “People do business with people they know, like and trust.” So the whole point is: how do you get to be known from people, how to you get them to like you and how to you earn their trust? It’s all about building a relationship that matters to both parties. It’s precisely what “the new relationship marketing” is about. Mainly targeting “a business person feeling the pressure to shift to using social media marketing to better understand the new soft skills required for success on the social web,” the book is also extremely reassuring and designed to overcome apprehension. The social web is not going to eat you up: anyone can carve up his piece of the always-on society on his own terms. After all, the operative word of the social web is ultimately conversation. Strike it when you want it and how you want it. It’s up to you to decide. Like Erik Qualman in Digital Leader: 5 Simple Keys to Success and Influence, which I reviewed earlier this year, Mari Smith dispels the threat that social networks still signify to many people. You don’t need to turn into social media addicts to survive. You need to know what you want to accomplish and work at it in a consistent fashion — as well as leverage key real world social values, and traditional soft skills. High tech is ultimately high touch — i.e. the ability to communicate your core values, to structure the relationship circles that matter to you, and incrementally build on these relationships. Nobody is expected to become an influencer overnight, but it’s up to each of us to create the environment that enables us to create the flow (flow into is the latin root of influence) that others will want to join. In the end, to understand social media, try to forget about the Rolodex metaphor. It’s not so much about who you know as it is about who knows you! This book is just as endearing as its author — enchanting by all accounts to use one of Guy Kawasaki’s favorite words. Numbers speak by themselves: Klip surpassed 1 million downloads in just over 100 days. That simple. Even if mobile video and video sharing are the rage, it’s still spectacular. Power Engineering = Ease of Use : A rather late comer to the app (no excuse when the founder is an old friend, Alain Rossmann), I must admit that I am blown away: it’s the highest quality video streaming around for mobile device with a fantastic recommendation engine suggesting videos, users and topics to follow; it includes SMS and iMessage to invite and tag friends. 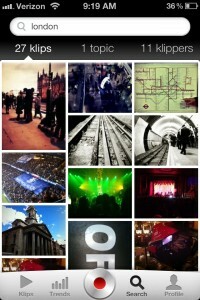 Klip stores my videos in the cloud and provides unlimited uploads for free. 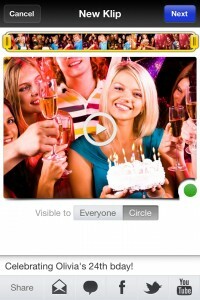 To make it short, Klip is the state-of-the art choice to create, store, and share videos on an Iphone. Clearly super high-tech brains can make gorgeous and easy-to-use apps. Now Privacy = Circle Management: Klip just released its 2.2 version that adds one of the best implementation of privacy I have seen on any mobile app: Circle-based privacy. The norm up to now for video app privacy has been very basic: the video is locked and you are the only one who can see it — or the way to open up is to an undiscoverable url that you can email to friends. Kind of lame and certainly not scalable. Klip changes all of this. You control privacy by adding or removing followers from your personal circle. Video uploads can be marked as visible to everybody or to just to your personal circle and circle videos are automatically restricted to the members of your circle. It is private sharing the way it should be: a breeze to use while still providing tight control. I love the fact that comments added to a private video are only visible to members of the circle and that only the owner of a private video can share it with others on social networks. So when you look at your feed, popular videos, or latest videos you automatically see in real time the public videos and the circle-only videos if you belong to that circle. 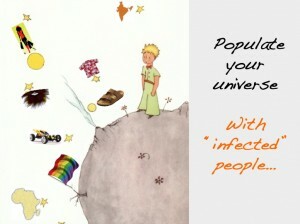 Each person has a personalized view of popular, latest, etc. You have a view that depends on the circles you belong too, all in real time. All the video metadata (comments, likes) are automatically restricted to the members of the circle. Also, and this too is really cool: If you add somebody to your circle all your prior circle videos become instantly available to him/her (and if you remove them, they can’t see what they used to see…). Klip creates magic by combining brilliant real-time cloud computing with a gorgeous, fluid Iphone interface. So don’t wait, get the free app here and tell me what you think. My friend Franklin Servan-Schreiber delivered a speech last week in Houston at the MD Anderson Cancer Center, and will speak on Tuesday at the Western Psychiatric Institute and Clinic in Pittsburgh about the final weeks of his brother, David Servan-Schreiber. 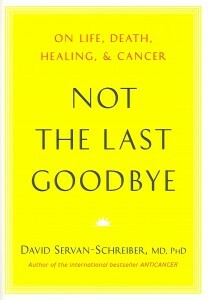 Co-founder of the Center for Integrative Medicine at the University of Pittsburgh Medical Center and one of the founders of the US branch of Médecins Sans Frontières, David was the author of multiple bestsellers including Healing Without Freud or Prozac and Anticancer, A New Way of Life and ultimately of Not the Last Goodbye: On Life, Death, Healing and Cancer that came out in France one month before David died (July 2011) and was published in the US in November 2011. “The support from my loved ones was a gift from heaven.” As David writes, “the sicker you feel, the lonelier you feel, and the more anxious you become.” When I read those words first in the French version, and then in the American one, I felt a pang remembering the help that David tried to provide to my own brother, the year before. The support that David received from his family was amazing and is the reason why this book exists. 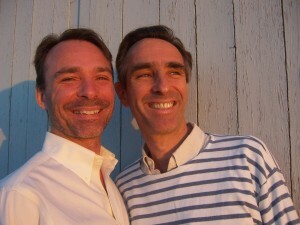 Over the months, David went through multiple treatments, but by February 2011, despair was settling in. He could not work any more and he didn’t have much to do, except to wait for death. 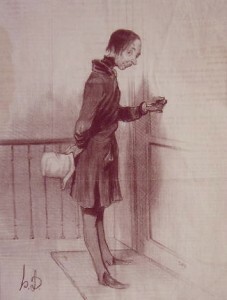 He felt increasingly despondent, Franklin recounts, at the idea that his readers would forever be discouraged from following his recommendations. That’s when Franklin helped his brother rebuild a sense of purpose: “Let’s kill two birds with one stone,” Franklin told him. “First you are really bored between treatments. Second, you owe it to your public, the people who trust you to explain what is happening to you and you will fill up your life.” At first David resisted. He was tired. But one morning, as his voice was starting to disappear, Franklin left him no choice: “We need to do it now.” Franklin knew it was urgent. He reminded his audience that doctors rarely describe to their patients, let alone to their families, what’s going to happen step by step — but he himself was made aware by a friend that degradation in cancer patients is not linear, and that everything can go well until one morning everything goes wrong. The number of weeks David still had was unclear. What was obvious was that he might be unable to speak at anytime. Franklin started to interview his brother in March 2011. His first question was unambiguous: “You are the author of Anticancer, you are dying of cancer. What do you have to say?” Wait for Chapter 11 before you know… for David had a lot to say over the course of seven interviews, transcribed by a journalist and infographic artist who had worked with him on Anticancer. David reviewed and corrected every single page. By June 15, 2011, the book was published, rose to number one in France the following week (believe it or not, people were reading this book on the beach! ), and remained number one until the Fall. David died a month later. Cancer has now become the leading cause of death in America. Each of us will have to take care of cancer patients at some point. David’s book is a must read. The huge success of Walter Isaacson’s book, Steve Jobs, shows the scope of our fascination for one of the top industry visionaries ever. While most people have come to realize the meaning of Steve Jobs almost in retrospect, for entrepreneurs starting in the eighties, he was already a thought-leader, and the Macintosh was already a metaphor for entrepreneurial audacity. One of the very first books to acknowledge this fact was Guy Kawasaki‘s The Macintosh Way in 1990. This was Guy’s first book. His French publisher, Diateino, just published abstracts, Le Style Macintosh, and I wrote the French preface whose English translation you will find below. One morning in 1989, I arrived at the ACIUS offices in Cupertino, CA, and, as usual, I went to say hello to Guy, then serving as President of the company we had co-founded. “How do you write a book?” he asked me. “You start on page 1 and finish on page 200 or 250,” I replied. I don’t think Guy was ever afraid that I would object to his writing a book, but he may have wanted to make sure I knew he was embarking on a project that would take up a chunk of his time away the company. It was clear to me, however, that if work kept him away from writing, he would regret it; I told him he constantly would be thinking of what might have been, and therefore would be less productive. He asked me if I had taken creative writing classes to write my own books, and I amused him greatly when I didn’t even understand to what he was referring. “So how will I know if it’s good?” he asked me. After he had written about sixty pages, he showed me the manuscript to get my opinion. I don’t remember making a great deal of comments – I simply found it good. What I had on my desk were the first chapters of the The Macintosh Way. Twenty-five years later, I find myself rereading this book with pleasure. In it, I truly recognize the Guy Kawasaki I knew in 1985, and the Guy I still know to this day. It is said that the best authors write just one book, over and over, and in most cases this is true. The Macintosh Way contains the seeds for a good deal of the ideas that Guy has explored and developed over the course of his subsequent books, some of which I have translated for Diateino Publishing in France. Every book is informed by an author’s previous works, which allow readers to find and trace enduring themes. 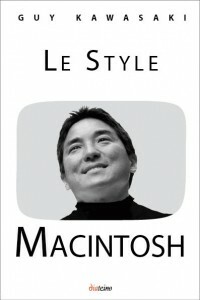 Read and judge for yourself whether I am wrong in thinking that The Macintosh Way is pure Guy Kawasaki. For fans of Apple, this is a return to the source, and for fans of computers, it’s a return to the origin of personal computing — to the root of the curated and comfortable technology experience we have all come to expect today. A few weeks after the death of Steve Jobs this book is obviously à propos, as it serves both as an historical account and a timeless manifesto of the entrepreneurial spirit. Taken as a piece of history: Even if Guy’s goal is not the chronicle of his life in the Macintosh division for which he was recruited in 1983 by a college friend, Mike Boich, his role in the group is present on nearly every page, as the book has an anecdotal backbone. In the French translation, we have removed some references that are firmly lodged in a bygone era, yet there are still a number of details that bring back to mind the incredible ebullience of the Silicon Valley in the eighties. Genius, just as now, waited for nothing; the overwhelming feeling that everything was changing around us urged people who have now become historical icons to push themselves to the limit – so far that even twenty years later some have retained this energy and vision to reimagine the world. It was certainly the case with Steve Jobs, but also with Bill Gates, who grew from genius programmer and industry leader into one of the most fascinating philanthropists in our world today. When Guy told me in 1989 that he would title his book The Macintosh Way, I liked the name but feared it would not age well over time. I understood his reasoning, of course, as the Mac represented the beginning of his professional life, the same way it represented mine as an entrepreneur. At the same time, however, the Apple world had already changed, and despite our faith in the Macintosh’s power and beauty, we could not help fighting a certain feeling of Paradise Lost. The original stars that had created the Apple aura, Steve Jobs at the helm, had almost all left, and the subject of conversations at cocktail parties all around the Valley dealt at least as much with the continual Apple reorganizations as with Macintosh software updates and new capabilities. In fact, many of us believed that the spirit of Macintosh now lay outside of Apple. We were proud, yes, but I for one could not shake the feeling that our loyalty was partly born out of nostalgia even though the “Macintosh way” had largely shaped our entrepreneurial style. Looking back, the title is far more powerful than I ever imagined in 1989. The Macintosh Way is not merely a series of tips collected in the Mac original heydays. In fact, as Guy reminds us in all his books and notably this one, experience can be a false guide: “Be wary of experience […] It is better to work with raw, enthusiastic potential than an old pro from a competitor who will merely transfer his old habits to a new product and company. ” The Macintosh Way is more of an existential experience, a manifesto for entrepreneurs who have the skill and guts to believe in their vision and do what they must in order to change the world for the better by bringing people something they didn’t even realize they needed.